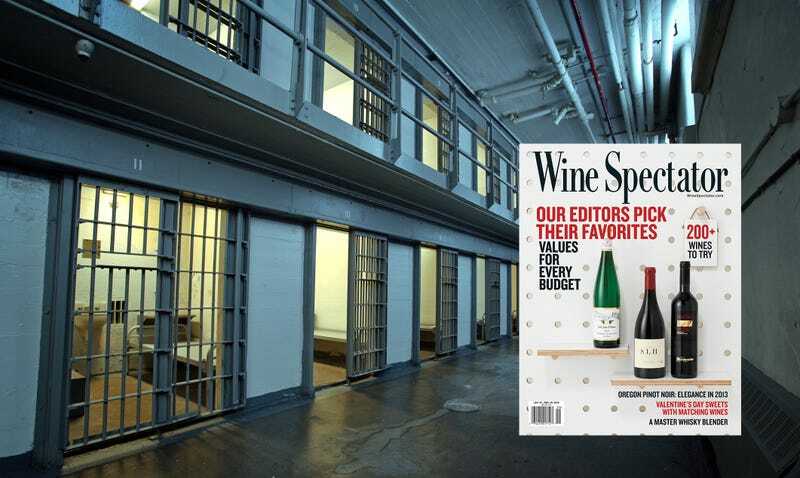 Rough news for prisoners hoping to keep tabs on this year’s Beaujolais: New Jersey’s Department Of Corrections reportedly bans Wine Spectator magazine from inmates. Wine Spectator itself reports that a magazine called “Wine Spectacular” (sic) is on the list of Jersey prison’s banned periodicals alongside related publications like Cocaine Nation and High Times. The prohibited materials came to light as part of an American Civil Liberties Union (ACLU) Of New Jersey request for documents that led to a reversal of the ban on Michelle Alexander’s The New Jim Crow, an award winning and previously off-limits book about race and mass incarceration. The reasons behind that book’s prohibition make sense—despite their questionable legality and ethics—but really, Wine Spectator? Wine Spectator’s Unfiltered blog reached out to New Jersey officials for confirmation that inmates are blocked from brushing up on 13 Hearty Rhône Reds From California or the latest St.-Émilion vineyard acquisition. “Since no such [‘Wine Spectacular’] book or magazine seems to exist, we inferred the New Jersey DOC meant to list Wine Spectator. When reached for comment, a DOC spokesperson would not confirm that the banned ‘Wine Spectacular’ is, in fact, supposed to be the same title as the discerning inmate’s go-to source for objective reviews of over 16,000 wines per year and in-depth features on wineries, restaurants and regions to watch,” Wine Spectator reports. While the banned periodicals may seem trivial, civil rights group have long argued that restricting access to certain materials violates prisoners’ First Amendment protections. Moreover, it’s difficult to imagine what harm could possibly come of inmates reading a wine magazine or Parents, which is also reportedly on the banned list. Perhaps New Jersey has a population of white-collar criminals for whom the inability to keep up to date with their Champagne vintages is a true inconvenience. But the Goldman-Sachs million-dollar wine bandit will be tried in New York, not the Garden State. Has anyone checked on the status of New York State Department Of Corrections’ Cigar Aficionado subscription?